The bridge that connects the main parking garage to the Atrium Building has always been a great place to stop and get a close look at the East Tower construction. And now, the view is even more exciting because the Edward A. Brennan Entry Pavilion is finally starting to take shape with steel structures connecting the new East Tower hospital building to the Atrium Building. The steel already is in place for the main entry vestibule and the elevated walkway that will connect the fourth floor of the Atrium to the East Tower’s fourth floor — and future home to one of three consecutive floors of the interventional platform. When it is open, this walkway, which is on the south side of the two buildings, will be accessible to patients and visitors, as well as Rush personnel. On the north side of the building, there will be a tiered set of walkways that will connect corresponding floors on the third, fourth, fifth, seventh and eighth floors. These walkways will be for patient and staff use only. 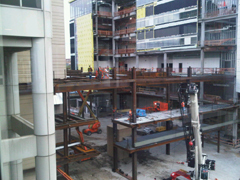 Steel already has been erected on all floors on these north walkways. The third-floor walkway will connect the non-invasive imaging floor of the East Tower to a new elevator being installed in the Atrium that will serve floors one, three, four, five, seven, eight and nine. This entry was posted in New Hospital Building, Rush Transformation and tagged east tower, new rush hospital, Rush Transformation. Bookmark the permalink.